This is not a long book but it is a gem packed with all sorts of tasty nuggets. There is a terrific introduction describing how the molecules in a raindrop cling together to keep the surface tension strong. But what happens on the edge of that raindrop, what happens when the surface breaks? This is what is covered in the stories within this book. The brevity of flash fiction is what makes it so powerful. Every word counts and nothing is wasted. I read this while travelling recently as I find books like this idea for times when attention levels are difficult to maintain for any length of time, or when there are constant interruptions. The stories in the first two sections, Mindscapes and Lifelines, are around 100 words long. The third section, called Microbursts, contains stories around 50 words long. And the words are beautiful. Concisely they get to the heart of everything, then delve further into the darker parts of our fragile existence. 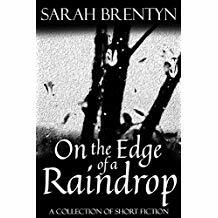 It is hard to write such perfect little stories in so few words, yet still have it mean something and manage to engender feelings in the reader, but Sarah Brentyn manages it incredibly well. Wonderfully written I highly recommend this book and look forward to reading her other work, Hinting at Shadows. Great review, Georgia. It’s on my kindle, waiting patiently to be read! I’ll be getting there soon. This is a lovely surprise, Georgia! I’m thrilled you liked On the Edge. Such a wonderful review. You’ve made my whole week. Thank you! What a lovely thing to say. ❤️ Thank you, again, for that!